I’ll let the Aunties explain what they’ve been up to whenever they feel like sharing. Me? I have to share now…Right now. 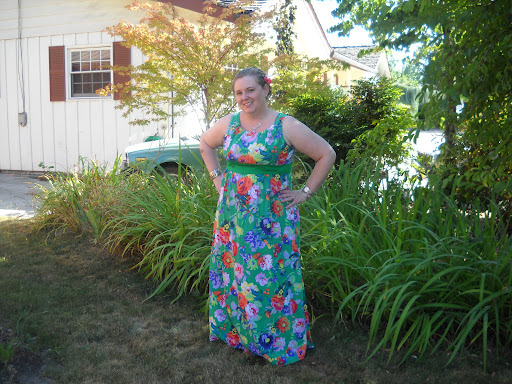 I started with Simplicity 2579, a now out-of-print pattern from 2009 that I picked up in a thrift store for 50 cents. Notice the contrast waist. I used that contrast fabric for the lining too. It does break up the print, but that’s not the original reason I used it. 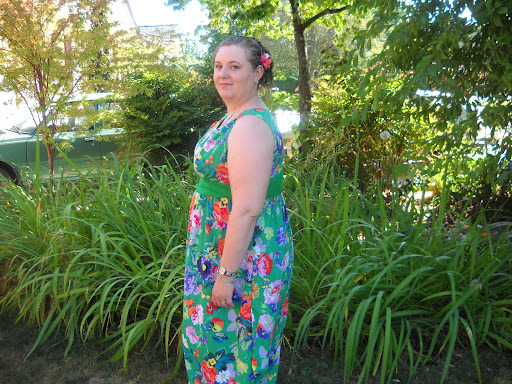 Being as the fabric was from a gifted stash, there wasn’t an option to just buy more, and the piece I had wasn’t quite enough to make the entire dress. It seems a bit strange that I just happened to have this bright green rayon in my stash, but it works, so I won’t question it. The main dress fabric I think is cotton or a mostly cotton blend. There are a couple of things I’m not entirely happy with about this dress. The first is that the armscyes stretched. I should have started off stay-stitching them. 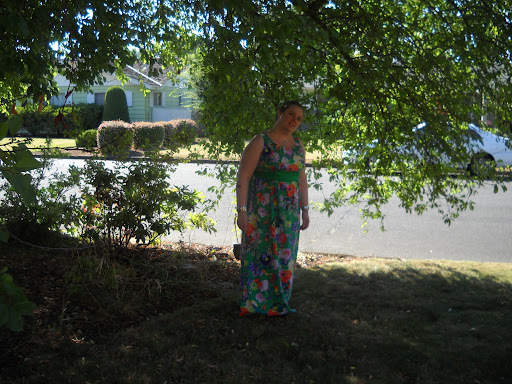 After the dress was “done” (meaning all in one piece, but not hemmed yet), instead of ripping the entire thing apart to go back to the first step, I just hiked up the shoulder seams and sewed a new seam. Now the shoulder seams aren’t encased in the lining, but at least the top fits. On that note, let me complain a bit about trying to do the FBA on this dress. It’s hard to see the detail with the extremely busy print, but the top of the bodice has pleats and the bottom edge of the bodice has gathers. Needless to say, the pattern piece for the dress bodice looks ridiculous. The lining piece, however, since it isn’t pleated, looks much more normal. I did the FBA on the lining piece first so I would have an idea of what the alterations should look like, then did the main bodice alteration, trying to ignore the neckline shape as much as possible. The haphazard way I guessed at how to do the FBA on this pattern may also have contributed to the poor fit at the armscyes. One last reason I love this dress (I’d try to take a close-up picture, but the print is so large that it wouldn’t come out right) That crazy loud print? It includes several kinds of flowers, several butterflies, and a variety of fruit including apples, strawberries, and cherries. If you squint really hard at the first picture, you might be able to make some of it out. 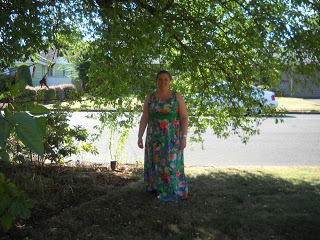 Even in the shade this dress is bright! Very nice! That print is really fun. 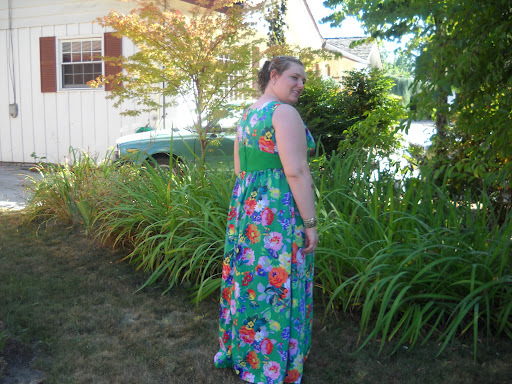 I love a good maxi dress. They are comfortable yet make you feel a little more dressed up. Your dress looks fabulous. I like the contrast waist a lot. Bravo!